RAPAPORT... A pink diamond recently submitted to the Central Gem Laboratory (CGL) in Tokyo was found to be a chemical vapor deposition (CVD) synthetic stone, treated only with Low Pressure-High Temperature (LPHT). 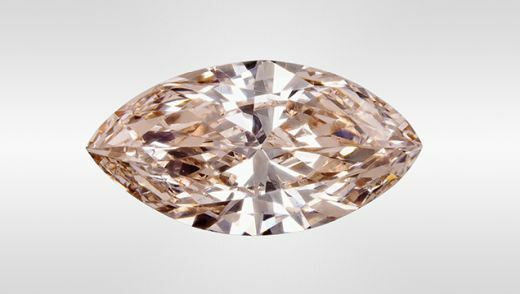 The marquise brilliant-cut, 0.192-carat diamond is an unusual find, as stones of this nature are generally treated with a multistep process that first uses High Pressure-High Temperature (HPHT) treatment to remove its brown hue. This is followed by electron irradiation, which modifies the stone’s structure and physical properties. Finally, the diamond is treated to low-temperature annealing — heating the stone to a specific temperature, and then cooling it at a very slow and controlled rate. “Pink CVD synthetic diamonds treated only with low pressure and high temperature (LPHT), without additional post-growth irradiation, have…been reported, but are rarely seen on the market,” researchers Hiroshi Kitawaki, Kentaro Emori, Mio Hisanaga, Masahiro Yamamoto and Makoto Okano said in the Fall 2018 issue of Gems & Gemology. Visually, the diamond was undistinguishable from a natural diamond. Further testing revealed the stone to be CVD, as certain aspects indicated it had not been treated with the normal, multistep process, but instead with LPHT. While sole use of LPHT is uncommon, it may become more widespread as the technique is improved, CGL noted.